Property 56: Welcome to a topstandard apartment next to the famouse Hornsberg Riviera! Property 68: Big and charming apartment in Central Stockholm. A comfortable and convenient place to stay in Stockholm. Dominic kindly worked hard to make the accommodation available for myself &amp; my daughter when other plans were cancelled on us at the last minute: much appreciated. He also gave us thorough instructions on the use of appliances etc as well as giving us some local knowledge for walks. 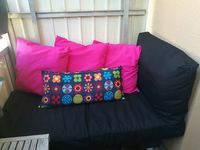 The beds were very comfortable and we were glad to have a place where we could cook meals and relax on the sofa. Wow--You Won't Top This Place! Anyone looking at my profile will see lots of 5 Star ratings and might be inclined to think my wife and I are easy to please. On the contrary, we are very particular. We tend to search fort higher end properties, are very careful in researching before we book, and--as a result--usually find great places. With that as a caveat, this may be the most beautiful and luxurious flat in which we have ever stayed, and that is not at all putting down any of the other great properties we have rented. 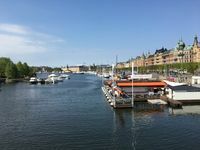 Not only that, the location can't be beat--close to much of central Stockholm, a stone's throw from Djurg&aring;rden for amazing running or walking--or even taking a dip in the sea (the &quot;Royal Canal&quot;)--and with a T-banna (tube) stop just a three minute walk away. The apartment itself is spacious, with tons of natural light and cross-ventilation, high-ceilings and beyond beautifully appointed (like Svenskt Tenn throw pillows). The appliances are top notch as well, and the whole kitchen set-up is first rate. The owners were completely responsive to email questions before, and during the stay, not that we had many of the latter. There is a charming porch/balcony overlooking the courtyard, and the coolest door handle/lock/alarm we have ever seen (smile). If you are going to be in Stockholm and this place is available, you would be crazy not to take it.